Recently Ubuntu has become the most talked about Operating System, people are trying to know all the features of it and exploring its interface. The Unity interface offers an incredibly quick and intuitive way to access your most commonly used applications from a launcher that appears on the left hand side of your screen. 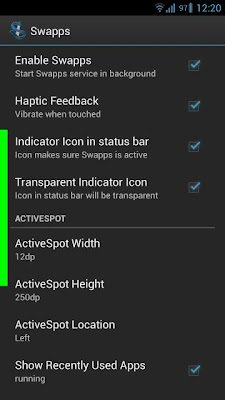 Developers have liked this feature and have built an "pseudo launcher" for Android devices called as Swapps. The most exciting feature of this launcher is that it does not replaces the devices main launcher, just as in Multi-tasking feature of Samsung Galaxy Note-II. 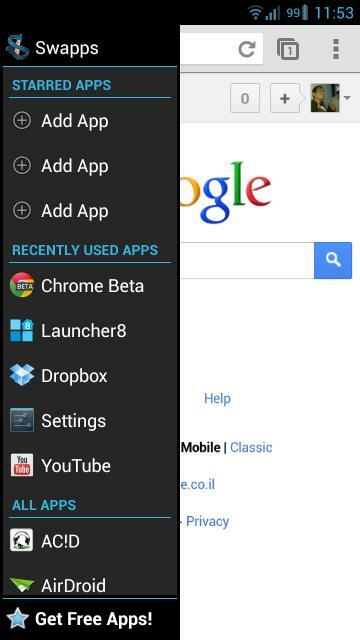 You can access all your applications from wherever you are without returning to the home screen in your Android devices. It is activated by swiping from the left hand side of the screen to reveal a list that is separated into three parts: favorite apps selected by the user, recently used apps. and a complete list of all the applications currently installed on the device. 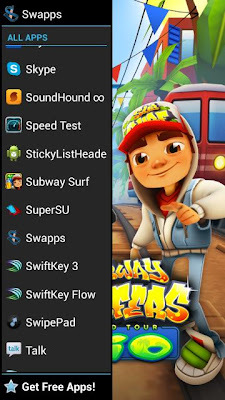 You can add up to ten of your most commonly used applications to the favorites section, and you can also customize any gesture for exiting this launcher.This is an application for making multitasking just a little bit easier in all Android phones because Multitasking feature is available only in recently available high end phones. Notification icon can be disabled or made transparent in the settings screen. You can get this application from Google Play Store.